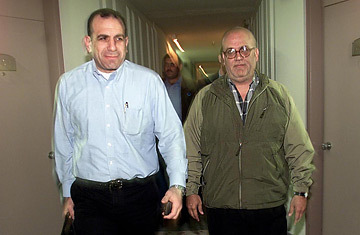 Israeli negotiator Gilead Sher (L) with Palestinian negotiator Saeb Erekat during the Taba Summit in Taba, Egypt, January 23, 2001. Agenda: The six days of talks, which followed frenetic negotiations in Washington and Cairo  and occurred amidst the escalating violence of the intifadah  were aimed at bridging the gap between the two sides revealed at Camp David, largely through a series of compromise proposals developed by President Clinton. Outcome: Although Taba came closer to agreeing on terms for a final settlement than any previous summits  negotiators from both sides said they were weeks away from reaching a deal  the Oslo process had run out of time. The summit ended only days before the Israeli election, which Barak lost to Ariel Sharon. The new prime minister was a staunch opponent of Oslo who had campaigned on promises to deal harshly with Palestinian violence. He made clear that the final-status talks that had begun at Camp David were now moot.